Ocean Optics spectrometer wavelength calibration sources are now available in configurations that span the UV to the NIR, with more convenient battery options, remote on/off, and LED indicators for battery charge and lamp activation. With more emission lines to utilize, maintaining optimum spectrometer performance – for example, correcting for spectrometer baseline drift and related phenomena inherent to all spectrometers — is simpler to achieve. The focus of this application note is the detection of adulteration in lavender essential oil using an attenuated total reflection infrared spectrometer, the Ocean Optics Ocean MZ5. Lavender oil is one of the best-selling oils and most adulterated . The Ocean MZ5 focuses on a portion (1818-909 cm-1) of the fingerprint region (~1500-500 cm-1), which gives a unique spectrum for each compound . Combining this region with the use of chemometrics, a powerful tool utilizing multivariate statistical analyses and data transformations, provides even greater analysis capabilities. It was determined that the limit of detection (LOD) of lavender in sweet almond oil is 6.74% and the LOD of sweet almond oil in lavender is 7.66%. Trade in your old spectrometer to receive a great discount on one of Ocean Optics' newest spectrometers! Need fast acquisition speed? Get Ocean FX! Require high-def optics in small bench design? Get Ocean HDX! Work with low light levels? 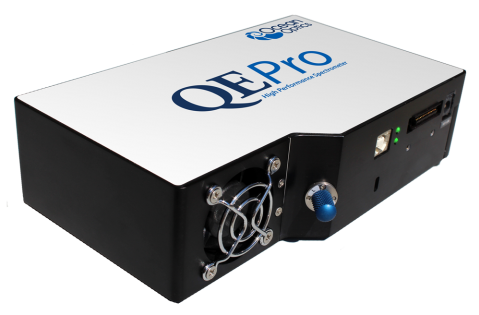 Get the QE Pro high-sensitivity spectrometer! Trade in any spectrometer for a discount of up to USD 1000/AUD 1350 on the purchase of any new Ocean Optics spectrometer of greater value. Ocean Optics: Ever Wonder What Goes on Inside a Spectrometer? Learn more about the spectrometer featured in this animation, the Ocean Optics QE Pro High Performance Spectrometer. From now through March 31, 2018, purchasea 4-channel RGB-NIR PixelCam Multispectral Camera from Ocean Optics and receive a 50% discount on standard pricing! That’s incredible value for a multispectral camera with frame rate, size, weight and power consumption comparable to monochrome cameras. Ocean Optics has extensive applications and OEM development experience across the UV, Visible and NIR ranges, while Pyreos is the world’s only supplier of thin film PZT pyroelectric sensors. These are used for MIR sensing including in-line arrays. The partnership combines Ocean Optics spectrometer design and manufacturing expertise with the Pyreos line array technology. Ocean and Pyreos are working on an ultra-fast, compact Mid-IR ATR reflectance system for labs that will set a new benchmark for size and value in the research and science market. This is expected in the first half of 2018. When you purchase an Ocean Optics spectrometer and accessories priced at 7,500 USD/10,000 AUD or greater, we’ll include a powerful new laptop and OceanView spectroscopy software -- at no extra charge. Terms and conditions below. Hurry: this offer has been extended to March 15, 2018. Contact Lastek today! Ocean Optics have packaged their spectrometers, accessories and software in convenient bundles to meet your most frequent measurement needs. Choose from standard and discounted options for absorbance, fluorescence, diffuse reflectance and plasma measurements. Reap the benefits of these application-ready setups and the option to select higher-value systems available at a great discount! Wave Illumination by Ocean Optics provides solutions for measuring the complex lit environment. WaveGo is ideal for applications that require a simple, yet highly accurate result when characterizing light sources. The app calculates all the essential metrics for quantifying light, with more features on the way. In this video, learn how optical oxygen sensing technology from Ocean Optics is faster, more versatile and easier to use than traditional oxygen sensing instrumentation. 25% Discount on Robust Oxygen Sensor Now Available! Purchase any NeoFox model through Dec. 30, 2017 at 25% off its retail price. A hundred years is a long time to wait for the chance to see a total solar eclipse. On August 21, 2017, with a rare eclipse tracing a path across the country from west to east, the U.S.A finally had their chance. For those who weren’t in the 60-70-mile “path of totality,” they could travel to the closest region of totality or experience partial eclipses from 75%-90% coverage (Figure 1). More than 300 million people in North America had a chance to view the eclipse according to NASA. The continent was gripped with eclipse mania in anticipation of such an epic, once-in-a-lifetime event. The Ocean OpticsOcean FX is a versatile spectrometer with acquisition speed up to 4,500 scans per second, onboard processing for improved SNR and reduced data transfer time, and robust communications via USB, SPI, Gigabit Ethernet and Wi-Fi. Ocean FX is an excellent choice for high-speed process applications, measurement of fast events, and reaction monitoring. The Ocean Optics Flame spectrometer is built using industry-leading manufacturing techniques that help deliver high thermal stability and low unit to unit variation — without compromising the flexibility and configurability that are the hallmark of Ocean Optics miniature spectrometers. New features such as interchangeable slits, indicator LEDs and simple device connectors deliver more freedom and less frustration. Whether you are an educator looking for an instrument to teach students the basic principles of spectroscopy, a research lab looking to make a breakthrough, or an engineer working to integrate a spectrometer into an OEM system, the Flame will provide you with the performance and features you need to make your UV-Vis spectroscopy application successful. Take advantage of application-ready Flame systems for UV-Vis absorbance, fluorescence, Vis-NIR reflectance and NIR spectroscopy. Special Offer: Trade in your old Ocean Optics spectrometer for a discount of up to A$2,000 on the purchase of any new Ocean Optics spectrometer of greater value. Further details below. Special offer on Ocean Optics QE Pro highest performance miniature spectrometers and NIRQUEST series spectrometers. The Ocean Optics QE Pro is a high-sensitivity spectrometer ideal for low light level applications such as fluorescence, DNA sequencing and Raman analysis. The QE Pro’s back thinned CCD detector has high quantum efficiency and its robust design yields great signal to noise performance and stability. An optional internal shutter is available for effective management of dark measurements. In addition, the interchangeable slit option allows users to switch between absorbance and fluorescence measurements easily. Ocean Optics are pleased to announceupdates to their line of light sources and radiometrically calibrated lamps that will simplify product selection process, deliver more features at comparable pricing, and ensure greater accuracy in calibrations. Details on changes affecting the DH- and HL- series radiometrically calibrated light sources and on improvements to calibration processes are available here. Deep-sea hydrothermal vents are home to some of the most interesting species in the world, ones that are uniquely adapted to the dark, hot, mineral-rich waters. These self-contained ecosystems have given rise to many gastropods and bivalves of interest to evolutionary biologists like Dr. Julia Sigwart, who has made it her mission to understand how species respond and adapt to environmental perturbations in order that we may better understand and protect them. Dr. Sigwart uses Ocean Optics oxygen probes to measure the metabolic rates of mollusks as a cue to understanding their basic physiology. The Ocean Optics NIRQuest is a versatile NIR spectrometer for applications ranging from moisture detection and chemical analysis to high-resolution laser and optical fiber characterization. NIRQuest spectrometers cover the wavelength range from 900-2500 nm. This year 2016 Coean Optics have refreshed the NIRQuest with a new replaceable slit design, and an optional internal shutter. The “Trail by Fire” project, funded by the 2015 bursary from Land Rover and the Royal Geographical Society (with the Institute of British Geographers) is an ambitious scientific expedition which will attempt to quantify the total amount of volatiles released by volcanoes along the Nazca subduction zone. Land Rover have turned a Defender 110 into the world’s first 4×4 volcano observatory, able to reach and measure active volcanoes never studied before. Ocean Opticsis proud to be a part of this expedition with Flame spectrometers measuring volcanic emissions on this journey of discovery. Heme proteins play many vital roles in mammal physiology, including the storage and transport of oxygen and the transport of electrons in the mitochondria, where the high-energy molecule ATP (adenosine trisphosphate) is synthesized. The presence of the heme prosthetic group in these proteins gives rise to UV-Vis absorbance spectra that vary with the state of the heme group. In this application note, we focus on the visible response of the heme group using the compact Ocean OpticsSpark spectral sensor to measure absorbance spectra for the heme proteins hemoglobin, myoglobin and cytochrome c.
Now is a great time to invest in Ocean Optics modular spectroscopy components and reap the benefits of the super-sleek Microsoft Surface Pro 3 (64GB/Intel i3-1.5Ghz). OceanView is the flagship software program for use with Ocean Optics spectrometers. Beer is one of the most popular beverages in the world, with global consumption in the billions of gallons per year. This great thirst for beer is quenched by an endless array of varieties characterized by their color, alcohol content and bitterness. The most common measurements brewers use to specify beer color, which is determined by the malt used to brew the beer, are the Standard Reference Method (SRM) and European Brewery Convention (EBC). The high-sensitivity Ocean Optics QE Prospectrometer is now available with an internal shutter for more effectively managing dark measurements in experiment setups. The shutter is useful for applications where light intensities change, requiring users to dynamically adjust integration times and renormalize the spectrometer. Trade Up to Great(er) Performance with the New Ocean Optics Flame Spectrometer! Trade in your Ocean Optics or other spectrometer for a discount for a short time on the new Flame spectrometer. The offer means a savings of nearly 40% on standard Flame models! Ocean Optics newest miniature spectrometer delivers great thermal stability and low unit-to-unit variability, with the freedom of interchangeable slits, simple device connectors and LED status indicators. Small, rugged and easy to integrate, the Flame spectrometer is ideal for OEMs, researchers and developers for a wide range of applications. Act now – the Flame trade-in offer is valid from 9 March 2015 through 30 April 2015. Place a spectrometer order valued at USD 5,000/AUD 6,500 or more and you will receive a FREE Surface Pro 3 and OceanView spectroscopy software. Announcing two great new Customer Rewards promotions from Ocean Optics, valid through September 19, 2014. First: purchase an NIRQuest, QE Pro or Ventana Spectrometer and you'll receive a free Windows 7 laptop and OceanView Spectroscopy Software! Second: Huge price reductions on combination systems based around the STS Microspectrometer System. More details on both promotions below. Ocean Optics has released a mobile application for iOS devices to the Apple App Store. The free application allows users of Apple’s iPhone, iPod touch and iPad to access helpful spectroscopy calculators, browse application support materials and access the latest technical product information on Ocean Optics spectrometers, sensors, light sources, and fiber optic capabilities. Three Ocean Optics instruments have completed their eight month journey to Mars to study soil composition as part of the ChemCam mission. NASA’s Mars Science Lab rover, Curiosity, was launched last November carrying customized Ocean Optics HR2000 spectrometers. Ocean Optics Maya 2000Pro offers high quantum efficiency and high dynamic range and is responsive in the deep UV (~185-300 nm). Raman spectroscopy is an excellent technique for the identification and characterization of fuels. With no requirement for sample preparation and the power to identify and quantify materials using robust, handheld, portable instrumentation, it is no surprise that Raman has found so many uses in a range of industries. In the case of fuels, Raman spectra contain a wealth of spectral features due to the presence of different types of hydrocarbons resulting in a unique Raman fingerprint based on chemical composition. The new USB Temperature Controller (USB-TC) from Ocean Optics is an attachable heating device for theUSB4000 and USB2000+ Miniature Spectrometers that greatly improves the stability of your measurements. The USB-TC attaches directly to your spectrometer's optical bench and maintains a preselected temperature that allows your spectrometer's optical alignment to remain accurate. Since optical stability is critical for applications such as LED manufacturing, the USB-TC delivers an exceptional result where repeatable results are most critical. Ocean Optics has added triggering functions to its popular USB2000+ miniature spectrometer to provide accurate timing and synchronization between the spectrometer and other devices. Four low-jitter trigger modes and normal (free-running spectral acquisition) operating modes are now possible. Applications include pulsing a light source to occur when acquiring a spectra and synchronizing spectral acquisition to coordinate with samples moving through a process stream or sensors reaching a certain temperature level. Spectral measurements to 153 nm can be achieved easily and economically with the high-sensitivity Ocean OpticsMaya2000 Pro with Extra-Deep-UV Option. Nitrogen purging of the spectrometer helps to mitigate water and oxygen absorption in the vacuum ultraviolet. A variety of materials have spectral signatures in the vacuum ultraviolet (VUV) spectral region, typically described as the region from 10 nm-200 nm1, 2. VUV spectroscopy is useful for applications ranging from biomedicine to semiconductor testing. Because the spectral response of standard silicon charge-coupled device (CCD) detectors drops off rapidly at wavelengths as long as 400 nm, and because oxygen and water absorb in the VUV spectral band, maintaining sufficient signal outside a vacuum is not possible. Designing vacuum-compatible spectrometers to address these issues can be difficult and expensive. As a result, most commercially available VUV spectrometers require custom configuration and are too expensive and unwieldy for many common applications. Dunedin, FL (December 10, 2010) – After collecting entries from optical sensing enthusiasts around the world, Ocean Optics has chosen the winners of its annual video and photo contest (www.oceanphotochallenge.com). Winner of the $2,500 Grand Prize in the video category, San Diego State University Student Cory Stinson, was chosen for his entry Into the Ocean of Optics and Lasers. In the photo category, Jeff Van Camp was awarded the $1,000 Grand Prize for his photo series A Quick Look Over the Shoulder. Stinson’s winning video highlights the capabilities of an Ocean Optics spectrometer with real time experimental footage and 3D computer animation. The experimental setup measures the spectrum of a laser output in real time while the majority of the laser beam that passes directly through a beam splitter is incident on a CCD sensor to look at spatial modulation. Dunedin, Florida (June 14, 2010) – Modular HR2000 spectrometers from Ocean Optics are enabling air quality monitoring in the Gulf of Mexico as part of Argos Scientific’s portable UV DOAS air monitoring system. Argos Scientific is working in conjunction with Hillsborough County, Florida, to monitor the environmental impact of the Deepwater Horizon oil spill in the Gulf of Mexico. The project has special significance to Ocean Optics as the company is located on the Gulf side of Florida and its community will be affected in coming months as the oil advances, upsetting both water and air quality. Last week, NASA announced the stunning discovery of water on the moon. This followed the deliberate crashing of a probe onto the lunar surface in October as part of the space agency's Lunar Crater Observation and Sensing Satellite(LCROSS) mission. The key measurements which enabled NASA scientists to conclude that water is definitely present on earth's nearest neighbour were made with a spectrometer which was designed and built by Ocean Optics. Known as ALICE, the instrument was a modified version of their highly sensitive model QE6500 spectrometer. It had to be sufficiently rugged to withstand the stresses of the journey and the crash-landing arrival, and then to function in the moon's extremely harsh environmental conditions. The success of the mission is testament to Ocean Optics unmatched capabilities in providing spectroscopic solutions for even the most demanding applications. Ocean Optics offer spectrometers and optical spectroscopy solutions for virtually every possible application. Recent new products include: New software for the Jaz Modular Spetcroscopy Measuring suite; Go Wireless with the new Remora; and neoFox, a new Phase Measurement System for fluorescence-based optical sensing. Details here .